As it ramps up to top speed, a natural cheetah pumps its legs in tandem, bounding until it reaches a full gallop. The key to the bounding algorithm is in programming each of the robot’s legs to exert a certain amount of force in the split second during which it hits the ground to maintain a given speed. In general, the faster the desired speed, the more force must be applied to propel the robot forward. Sangbae Kim, an associate professor of mechanical engineering at MIT, hypothesizes that this force-control approach to robotic running is similar, in principle, to the way world-class sprinters race. “Most robots are sluggish and heavy, and thus they cannot control force in high-speed situations,” Kim says. He says what makes the MIT robot so dynamic is a custom-designed, high-torque-density electric motor, designed by Jeffrey Lang, the Vitesse Professor of Electrical Engineering at MIT. These motors are controlled by amplifiers designed by David Otten, a principal research engineer in MIT’s Research Laboratory of Electronics. 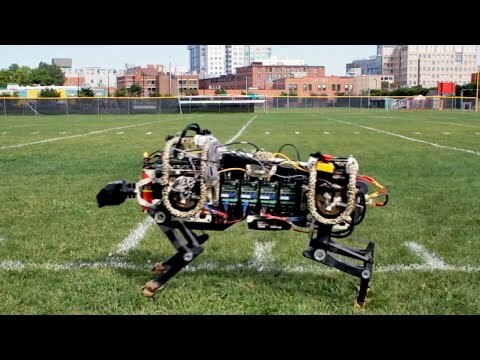 The combination of such special electric motors and custom-designed, bio-inspired legs allow force control on the ground without relying on delicate force sensors on the feet. Kim and his colleagues will present details of the bounding algorithm at the IEEE/RSJ International Conference on Intelligent Robots and Systems, currently in progress in Chicago.